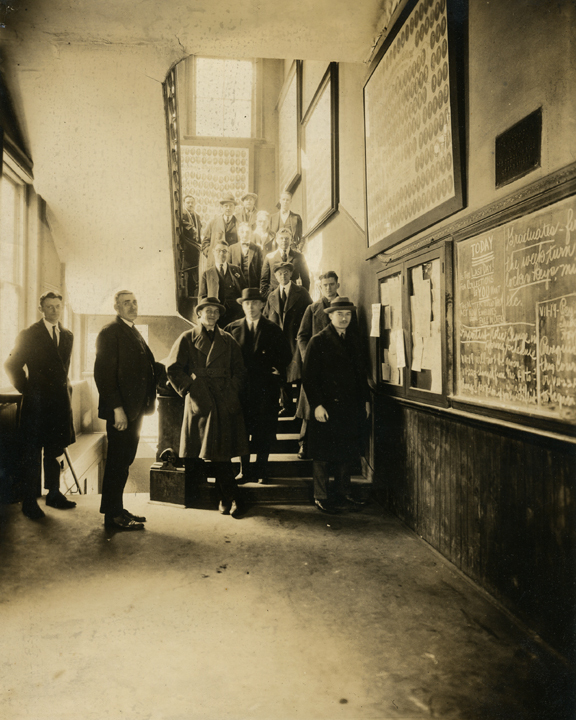 In this photo from the Rush Archives, faculty and students stand on the staircase of the original Rush Medical College building on what is now the Rush University Medical Center campus. The Rush Medical College building was constructed on the northeast corner of Wood and Harrison streets in 1876. It served as a multipurpose facility. In addition to classrooms and a lecture amphitheater, the structure included a free dispensary with a large waiting room, a drugstore, 10 consultation rooms for private clinics, professors’ offices, a dissecting room, a museum, and a bedroom and parlor for its live-in janitor. The building stood at this location for nearly 50 years. It was replaced by the Rawson building in 1924. Heather Stecklein is an archivist with Rush University Medical Center. You can contact the Archives at rush_archives@rush.edu or at (312) 942-7214. This entry was posted in Rush Archives, Rush University and tagged Chicago history, rush medical college. Bookmark the permalink.